This is the Agera RS, NOT the new supercar. Koenigsegg, the Swedish supercar company that sells about 20 supercars a year, has plans for a new supercar for 2020, and one that will be made in higher quantities than Koenigsegg has traditionally made their supercars, Christian Koenigsegg told Top Gear in an interview published Thursday. This car is apparently not the Ragnarok, but something else entirely. 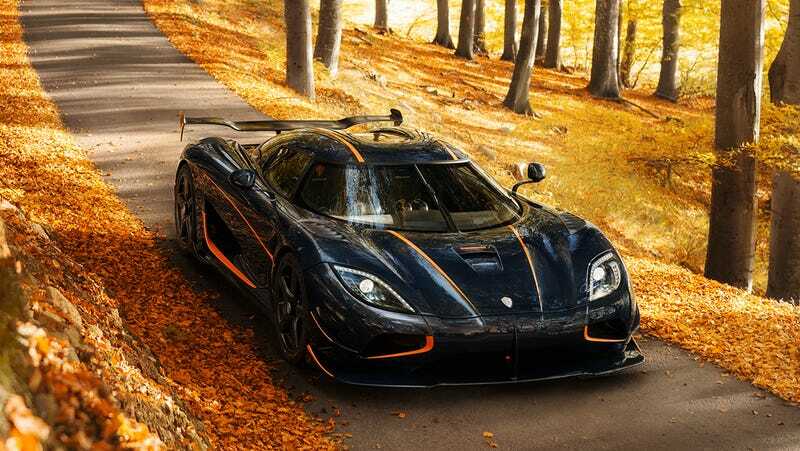 The car will also come at a lower price point than is traditional for Koenigsegg, or somewhere in the neighborhood of one million euros, or less than half the cost of the Agera RS, which is extremely fast. Top Gear is sure to say that this new supercar is NOT the successor to the Agera, but instead intended to increase Koenigsegg’s sales volumes, since only a handful of people can afford a $2.5 million car, but a bigger handful can afford a $1.1 million car. The cheap car will be emissions neutral, Christian Koenigsegg said, using some pretty complex technology that the company’s been developing for its hybrid engine. “We’ve been looking to expand our offering because basically, our brand has outgrown our production volumes by quite a big margin,” he tells TopGear.com. “We have several years of delivery time on the super-exclusive hypercars we’re building today. “But we do think if we make a super-exclusive, custom built supercar at a slightly lower price (that’s the €1m mark) we could get the volumes into the hundreds.” Step forward NEVS – short for National Electric Vehicle Sweden – who have signed a joint venture with Koenigsegg to help deliver this. NEVS are specialists in green technology, which brings us onto how this new supercar will be powered. “Our ambition is that this car will be completely CO2 neutral,” Christian tells TG. How? Koenigsegg’s ‘freevalve’ camless combustion engine technology, combined with electrification. So it’ll be a hybrid supercar using tech the company’s been working on for the last couple of years. Koenigsegg is making a calculated bet on a future in which batteries might get harder and harder to come by and increasingly expensive as electric cars become more common. This on paper, seems pretty smart honestly, even if I’ll never be able to afford a Koenigsegg on my own, which is probably for the best. Have you ever driven a supercar? Have you ever been inside one? The experience is amazing, but kind of like going to your in-laws house, as you spend most of the time stressed and worried you’re going to break something.